I’m sort of reminded of the Y2K excitement when people are now talking about the fact that the whole Facebook interface changes for good – across the board – in a matter of weeks. It’s not that we didn’t know that the Timeline structure would be pushed to everyone, it’s just the effect it has on Facebook Pages. There is so much darn branded content that needs to be wholly redone to work within the new layout. If you’re a brand that has one – or even a dozen – FB pages (and a number of tabs) then it shouldn’t be a problem. But, if you have hundreds or even thousands of pages with bunches of tabs, you could be in trouble. 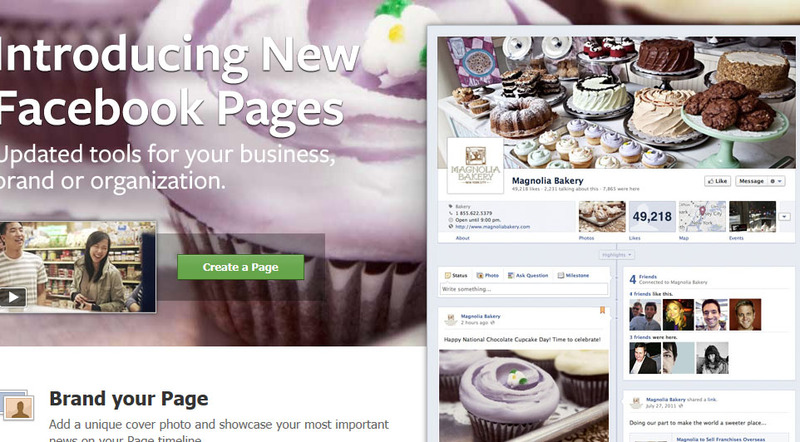 Other than the fact that the layout is changing (and that Facebook must be getting a lifetime supply of cupcakes with their sample of Magnolia Bakery on the Pages page), the main differences are in the control of the entry point and the amount of Tabs a brand can maintain. Without being able to force people to either Like or enter an email upon first arriving at the page means that brands will now have to find a better way to get people to commit without their exploration seeming to need a gateway. With the addition of 4 Favorites buttons that act more like navigation buttons, brands will have to put a little more thought into their presentation strategies. Will they use those to garner Likes or collect emails, or will those items be placed on the Wall for larger presence – which would also require closer management. Brands can send users specifically to a Favorites tab page via a URL, but companies can no longer rely on that gateway upon entry. On the good side, it seems like this major change will help to stop all the micro changes that the Facebook engineers unleashed on a seemingly bi-weekly schedule with no notice for the past few years. Nothing created more headaches than waking up and seeing that your pages are broken and nobody was prepared (or paid) to update it. The hope is that these more structured and formalized pages will make those micro-changes unnecessary. Additionally, with the timeline, it will be easier to tell your corporate story by putting communications or newsletters on your pages and actually have them better reflect progression over time rather than a hodge-podge of items that might come if they weren’t anchored to an exact time. Additionally, the opportunity to push your creativity will be presented as the timeline will be more kind to graphic posts. In the long run, it seems these changes will make population and content management more standardized. This could make things a lot more easy and allow for companies to rely on Facebook as an even simpler way to even replace an unwieldy and expensive custom site. I’m sure Facebook looked at the migration of companies from expensive sites to easy (and free) sites on platforms like WordPress caused them to take a deep look inward and provide their own solution. Putting my user hat on, I’m very happy that I no longer have to Like something or submit my email address just to be able to see content for a possible vendor. even from the marketing perspective, I would rather have unencumbered eyeballs on my content and then step up to the challenge of developing good incentives to have them Like my product or enter their email because they actually like what we’re about – not just because its what they’re about to see. So, while many brand marketers may be flailing in the short-term to make things right with the transition, this could be the key to really providing stability and a strong presence for all who approach this new landscape smartly and strategically.